« Two Swedish girls about reaction videos and K-pop in Sweden. Gabriela (aka Gabasia), a Polish dancing girl in love with K-pop. One of the first youtube users dancing to K-pop songs would be, I suppose, Gabriela (aka Gabasia). It would be safe to say that she was one the great contributers to the K-pop dance cover fever all around the world. But, for some reason, she stopped uploading her cover dances a while although she came bakc to us with her new dances. We know that there are sill many Kpop fans missing her TVXQ’s dances. Sarangkpop contact her and this shy girl opened her mind towards us. I started listening to k-pop 5 years ago. My first k-pop song was “Hug” by TVXQ. It is funny couse I found it by searching for “cute asian boys” ^^;; That was weird. But I fell in love with TVXQ and thanks to them I got to know all other artists. I LOVE TVXQ. I know nowadays they have a lot of issues but I believe they will finally get back together. But because there aren’t any new TVXQ songs (and I don’t really like the idea of Yunho and Changmin being treated as “TVXQ”) I listen a lot to MBLAQ. I get all my k-pop materials through the internet ^^. There is no other way to get them in Poland. 5. which kpop dance cover was the hardest one so far? I think the hardest one was “Y”. I practiced it a lot and it still didn’t look perfect. It was difficult. Oh, but also Yunho’s SBS Gayo DaeJun solo was very challenging. I remember I wanted to cry couse the part “All night show with just you and the crowd” would never work out ^^. 6. do you have any Kpop dance cover you are planning now? If so, what is it? Aaah, I don’t really know. Usually I spontaneously choose the dance that I want to learn. ^^ Right now I really like choreography in “Stay” by MBLAQ and “V.V.I.P” by Seungri. 7. do you belong to a dance crew? If so, please introduce it to us. I was in a dance crew Dissgroup, but I had to quit because of studies. We danced hip hop on various polish contests. 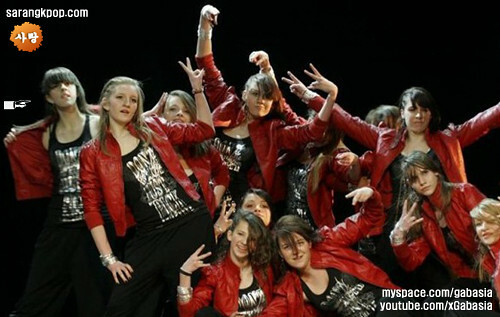 It was girls-only dance crew so we always had a lot fun ^^. They’re still dancing so maybe in future I will be able to dance with them again. 8. where do you practice dancing? How long and how often do you practice? When I was in a dance crew we practiced 3 times a week in our dance school. But now I usually practice at home, infront of the mirror ^^. I try to dance everyday. 9. we could see a logo of some dance studio in your videos. Do you go to a dance school? Yes, the logo belongs to dance school where my crew practiced. 10. you uploaded 3~4 dance covers a month in the past and then you went on holiday for about 8 months(^_^). What did you do during the holiday? I had a lot to think about ^^. I was in IB school at it was a hell. When I finally finished it I wanted to relax. I had 4 months of vacation. After that I started studying and it also changed a lot. If I don’t learn I spend time with friends from my college couse they are like family to me. However recently I try to find some time to learn k-pop dances ^^. 11. can you speak Korean? 12. can you tell us what Korean sounds like to foreigners like you? Does it sound soft, good, bad? How does it sound compared to Chinese or Japanese? I LOVE sound of Korean language. When someone speaks Korean sometimes it sounds like he’s singing ^^. It is really cute. I prefer it to Chinesee and Japanese. But still I really like Japanese language and after I learn it I will start learning Korean. 13, do you think Korean is hard to pronounce? Which Korean word is most difficult for you to pronounce? Hm. Korean is quite difficult… But it’s not that difficult to pronounce. At least not for Polish people ^^ Polish language is one of the most difficult languages in the world. But thanks to that pronouncation of other languages is quite easy for us.